Thinking about upgrading to Firefox 2? Wondering if RMD will work after the update? Fret not, RMD supports Firefox 2. In fact, it has for the past month or so. It now works fine for me but i did hit an odd problem. On upgrade the domains i had ‘remembered’ didnt allow me access. Entering the url and hitting the returned caused FF to do nothing. DIsabled RMD and re-enabling cured this. I also had to clear the browser cache too to clear another url issue. My last comment should have read the included text “Entering the url and hitting the return key”. Thanks for the heads up Paul. 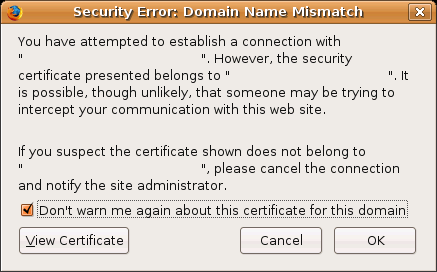 For the record it was Firefox on Linux where this happened? yip, on firefox on mandriva 2006 on linux. still having this ‘blocking’ problem. if i clear RMD prefs and restart i can access https sites and add them to RMD. on the next browser restart those sites cannot be accessed. Do you plan to release Seamonkey and Sunbird versions, please? Re Firefox “blocking” problem: I think I’m seeing this on Thunderbird 2.0 (pre-b1). From a tcpdump, it seems that Thunderbird is resetting the connection (TCP RST). This didn’t happen on 1.5.0.7. @Paul Black, thanks for the confirmation. I kind of figured new versions of TB would be affected too… Thus far a common thread for those seeing this problem is linux. That apply in your case too? Thanks to Paul Forsyth’s help I’m now able to reproduce it consistently. I’m currently at the ‘baffled’ stage of finding a fix ;-) (Plugging away though). Yes, my Thunderbird is on Linux. Woops, looks like I just found it. Thanks!